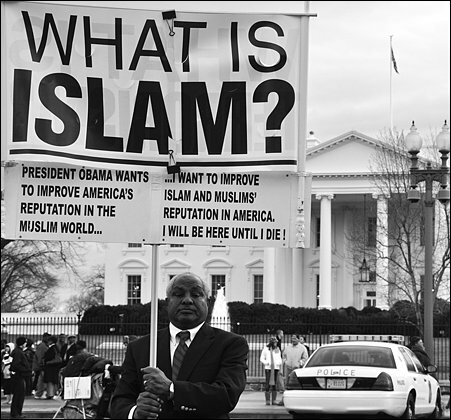 Most weekends, in front of the White House, you will come upon a one-man jihad, a man in a dark suit fighting against Islamophobia. He carries a large banner with messages on either side. One side reads, "What is Terrorism?" and the other side, "What is Islam?" In small print on both sides, the banner adds: "31 Years Washington Journalist. Don't Trust Politicians. Appeal to People's Conscious [sic]. Will be here until I die!" He would like to raise enough money at his website to be able to vigil full-time for the rest of his life. This is Mohammad Ali Salih, who immigrated here from northern Sudan in 1980 and has since then worked as a freelance journalist for American and Arab newspapers. His op-eds have been published repeatedly in the New York Times and the Washington Post, among other prominent U.S. newspapers. He has been married for 35 years to a white conservative Christian Republican, whom he met in this country. Together they have borne three children and reside in Burke , Virginia . He had wanted his children to have not one race but two. Now he realizes that race doesn't matter and that mixed race doesn't matter, but that "the new 'post-race' thinking could be equivalent to 'no race.' His son refers to himself not as biracial but "post-racial." He has immersed himself and his children in other religions of this country and the world, including Christianity, Judaism, Hinduism, and Buddhism. He has written of spending a day of Ramadan at a Catholic monastery and of attending Orthodox Jewish Rosh Hashanah and Yom Kippur services as well as a Passover Seder. He is teaching his children to be open-minded. This writer got to know him at DCIPI (DC Interfaith Peace Initiative) meetings. a group that discusses and activates interfaith outreach ideas and events--one of many in this enlightened and cosmopolitan area. "The eldest of 15 brothers and sisters, I was probably three-years old, with my father and mother in a ten-by-ten ft. mud room that had a ceiling of tree branches and leaves, like most houses in my poor Sudanese village, on the Nile River, south of the borders with Egypt. "It was evening and the room became dark and my mother lightened a kerosene lamp, and my father struggled to start a portable kerosene pressurized stove. Those were the first Western technologies my father bought after he married my mother and they were the latest in a village where most people use candles for light and wood for cooking. "That evening, while my mother was making "shai samooti," (heated milk with tea), our evening meal with home-made biscuit or dried bread, my father spread on the floor a colorful mat, faced Mecca and started 'Magrib' (sunset) prayer. He stood up, loudly recited verses from the Koran, bent forward, sat down, touched the floor with his forehead, stood up and repeated those movements few more times. "I can still visualize the singing sound of the Qu'ran verses mixed with the sound of the pressurized-stove's blue flames, while I was waiting for supper. . . ."
"My village looks like one of those Afghan villages shown on TV, with mud houses, donkey carts and men in flowing garments. Sheep and goats are kept inside homes; dogs wander the streets; women cover their bodies and hair, but not their faces." Further on his lone crusade: "Since Sept. 11, 2001, I have felt sadness, anger and frustration because of what I had come to believe were President George W. Bush's subtle wars on Muslims. Because I had no outlet for this opinion in U.S. newspapers, I launched my one-man campaign." Mohammed's weekend vigils in front of the white House began in 2008, the last days of the Bush administration, in his despair over the Islamophobia and Bush's "War on Terrorism" that has since 9/11 pervaded this country. He also began to write op-eds for U.S. newspapers. "Believing that my conduct was part of my message, I dressed in dark suits, refused to engage in discussions, and only briefly and quietly answered questions." "But after watching Obama in the White House for [ . . . ], I had come to believe that he is a typical politician who makes promises in order to be elected and, once elected, starts planning to be reelected." On January 16, 2010, in a Washington Post op-ed, Mohammad announced that he was resuming his jihad in front of the White House. "I am not faithful enough to sacrifice with my money (I barely make ends meet), with my family (I want them to be near me), or my life (I don't think I have enough left). So this weekend I will resume my jihad in front of the White House--peacefully, silently and alone. Mohammad is first a Muslim, then an Arab, then an American--he is a citizen of this country. He refers to his identity in terms of four minorities: "Muslim, Arab, African, and 'foreigner'." As to his outspoken priorities, he writes: 1) "My relation to God is the core of my identity. It supersedes my relations to countries and peoples and is separate from my citizenship. His religiosity has come and gone throughout his life; most lately, he has rediscovered Islam and is once again studying Koran--this time as an adult." 2) "I am Arab because Arabic is my native tongue, the core of my culture. I think, talk, write (and dream) mostly in Arabic." 3) "My love for America started long before I came here, by reading, writing, thinking, and dreaming about America--in Arabic. My religion was never an obstacle and actually was an incentive. I dreamed of worshiping God in America the way I wanted, with no restrictions from oppressive Islamic governments, medieval sharia scholars, and the people around me. "But, like love that develops into marriage, I had to come to America and become a citizen to be a full American. And, [pledging allegiance is] like pledging to a marriage: 'I pledge allegiance to the flag of the United States of America , . . . one nation under God.' That's when I said to myself: 'God is paramount here, too.'" "Previous Pew polls showed that 42 percent of Christians identify with their religion before their country. . . . That doesn't make them less American." "The hundreds of warnings, in a tough language, to those who stray from the 'Straight Path,'　. . . ? The rest of the Koran, like all other major religions, calls for love, peace and justice, but I have found that accompanied by warnings, threads and repeated mentioning of 'Hell's Fire.' I have found God both merciful and angry, but, I am afraid, I feel He is more angry, which adds to my fear of Him.? [Also striking to Mohammed are] 'sensational' verses about cutting hands, stoning sinners and marrying four wives, [which occur in] very few . . . numbers. All the verses about that and the rest of the Sharia (Islamic laws) [comprise] about 1 percent of the whole Qu'ran. [The rest] is God talking about His powers, books, angels, prophets, and about right and wrong and heaven and hell.? [Also striking are] the very many times God refers to Himself; in almost every verse and, sometimes, more than once in a verse. There are about 7,000 'ayat' (verses) in the Koran, divided into 114 'suras' (chapters). There are probably 7,000 mentions of, or references to, God. And, on the subject of religious values, in another of his op-eds he recalls a conversation among some of the men in the village he once called home. They were railing against the wickedness of Westerners when one old man chimed in, "Why speak of punishing these people instead of helping them?" He wrote about a cover story that appeared in Time magazine August 30, 2010, on Islamophobia: It mentioned that more than half of Americans had a negative attitude toward Islam and Muslims and that almost half of them said that Muslims believed in ideas contrary to basic American ideals of freedom and justice. The magazine said Islamophobia influenced domestic and foreign U.S. policies. Further, according to Time, in 2003, "a survey by Pew Research Center found that the percentage of those holding a "favorable view" of the United States was as low as 1 percent in Jordan , 13 percent in Pakistan and 15 percent in Turkey ." "However, those who admired U.S. technological achievements were 59 percent in Jordan and 42 percent in Pakistan . Opinion of U.S. popular culture was mixed, but more positive than one might expect. In Lebanon , 65 percent said they liked American music, movies and television, and in African countries with significant Muslim populations, such as Senegal and Nigeria , majorities said they liked American popular culture, although majorities in Jordan and Egypt said the opposite." He marvels at Hillary Clinton's request to Congress for more funding for the State Department to be spent on improving the U.S.'s image in the world, as if money were the answer, as if minds could be changed with the right p.r. ,"as if the U.S. reputation were based on how much we spend." He is bitterly disappointed that the U.S. supports the partitioning of his native country, wondering where the spirit of Lincoln has fled, a spirit that fought to the death to keep this country whole. "1960's and 1970's (in Sudan ): supported Egypt 's Nasser call for the expulsion of the Jews." "1980's, 1990's and 2000's　(in U.S.A. ): supported the two-state solution." "2010 and 2011: support one Palestine/Israel because　I have come to believe that the Israelis, with the help of the U.S. , will expand the　settlements and will not accept a　viable and　sovereign Palestinian state. Many countries might recognize th current　Palestinian 'state,' but, it is not a state. Within a Jewish/Palestinian state, the Palestinians can expand in numbers and call for equal rights." Mohammad has written for numerous Arab newspapers and magazines, including three privately owned but under Saudi government control. From the 2000s to the present, he has been a Washington correspondent for one of these, Asharq Alwasat ("The Middle East"), an Arabic international daily published out of London . Twenty of his articles, on a wide array of subjects, are online athttp://www.asharq-e.com/. Those are the only ones accessible in English. Type his name into the search space to pull up articles he has written. Photos courtesy of Mohammad Ali Salih.